Mixing the twelfth installment of the Robotic Peacock Mix (RPM) series is Detroit-based DJ/producer Ryan Thomas, known musically as Bale Defoe. 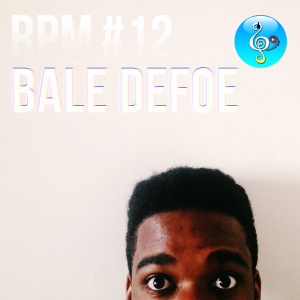 Since returning from grad school in New York City late last year, Bale Defoe has been piquing interest in the Detroit music scene. His recent mix series, Grown Folks Business, has put his beat dexterity, refined song selections and crisp music productions on full display. As the music blog Motor City Ragers articulately states, “Bale Defoe… will leave no stone unturned searching for the next record to get your feet moving.” The Rager Haus artist is gearing up for a busy fall as he prepares to release a couple of EPs and a collaborative side project with fellow Rager Haus artist, Ryan McCray. We were thrilled to catch up with him and chat about his influences, collaborative process, upcoming releases, and where he came up with his name. Enjoy the mix! RP: Hi Ryan, thanks for meeting with us today! So how did you get into dance music? BD: I’m originally from Romulus – where the Detroit airport is – and Belleville is down the street (where Kevin Saunderson, Derrick May, Juan Atkins went to school) so some of that techno bled into Romulus a bit and then my parents always had very eclectic taste. Late high school is when my love for house music was solidified and then it just took off. I’ve always been more into the deep house stuff because the soul/jazz R-n-B influences are what I love more than anything. When did you decide you wanted to start pursuing music and DJing? I played saxophone and trombone when I was young but my pursuit of music production really started when I was 16/17 years old. I remember it was around the holidays and my brother was wondering why I didn’t do too much music anymore so we went to Guitar Center and he bought me a keyboard and Fruity Loops. For the next year or so I dabbled in production but didn’t do it too seriously. My sophomore year of college at CMU I went out and bought Maschine and put together my own studio set-up. That’s when I started taking music production more seriously and then 3 years ago is when I really started putting stuff out and making mixes. So where’s the name Bale Defoe from? How did you come up with it? I’m a huge soccer fan and my favorite team is Tottenham Hotspur. One of my favorite players, Gareth Bale, used to play for them (he now plays for Real Madrid) so I basically used his surname and also Jermain Defoe (another soccer player who also used to play for Tottenham) and put their last names together. So people either get it right away or they ask where I came up with the name, haha. Well my biggest influence in the DJ world would be A-Trak because he has no musical boundaries. I appreciate the fact that he respects the music scene as a whole and will incorporate different genres in his sets so I try to always listen to different kinds of music and then pull samples from everything. I also enjoy the Fool’s Gold label and that’s what I love about the direction Rager Haus is moving in—it’s incorporating lots of genres— hip hop, R-n-B, electronic music and Fool’s Gold is the same way. A lot of my favorite artists— The Cool Kids, Treasure Fingers —have released music on that label. Speaking of Rager Haus, you and Ryan McCray, another artist on the label who you collaborate with under the guise as BlackBass, just released a track this week called “Lemme See.” Tell us about that collaborative creative process. Sounds like a very organic process. In addition to “Lemme See,” any other upcoming releases our readers should know about? My mix series, Grown Folks Business, has a lot of original tracks on it — there’s a solid 18 months of studio work on there. Now I’m working with Rager Haus to put together a plan to release it in physical format. Ryan and I are working on putting out a solid 5 or 6 track EP in the fall. And I’ll be rounding out the year with a couple of solo releases. It was a little bit of a departure from what I’ve been doing with Grown Folks Business because I was incorporating a lot of originals into those mixes but in this mix I only included one original and the rest are from different artists. It’s probably one of the weirder mixes and it’s not as high tempo as most of them. I combed thru a lot of stuff I’ve gotten over the last 3 years…a lot of UK artists like Jimpster and stuff like that. Also, I’m a huge Detroit Swindle fan and the run they’ve been on for the past 3-4 years is, in my opinion, in connection with my music library, the greatest run I’ve seen in my lifetime in terms of production and even just their growth since their first EP is tremendous. It’s just incredible to see an artist grow so much. So many people don’t give electronic music a lot of credit in regards to what goes into it and the creativity portion so I really try to display that with a lot of the deeper stuff and I hope that it comes through that way.